Rider & Company published the first member of the seminal, highly respected, and very popular family of decks known as Rider-Waite-Smith (RWS), in 1909. It was designed by the famous esotericist and Christian mystic A.E. Waite. The evocative art, deftly drawn by Pamela Colman Smith, is reminiscent of the late Middle Ages or early Renaissance. Unlike nearly all earlier decks, such as Tarot of Marseilles decks, the numeric cards (those suited cards numbered Ace through Ten) include illustrations which were specifically designed, in part, to facilitate divination. For example, compare the Six of Cups from a RWS deck (left) and to that of a Marseilles deck by clicking here. Because a wealth of books, Websites, and users of RWS exist, these decks may be particularly suited to new Tarotists. Indeed, beginners often report that they are especially user-friendly. 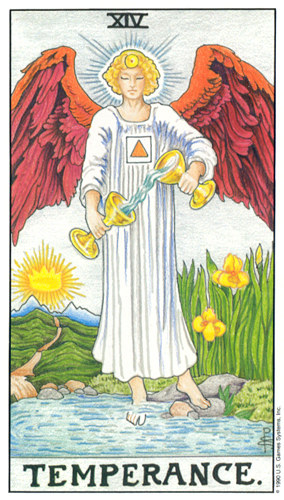 Illustration (above): Six of Cups from The Albano-Waite Tarot (copyright © 1991 U.S. Games Systems). Click the image for a larger one. However, dont be fooled; RWS decks, especially the Major Arcana, possess profound depth, including plenty of esoteric symbolism, both traditional and innovative. They frequently reflect the teachings of the Golden Dawn which included Waite and Smith as members. 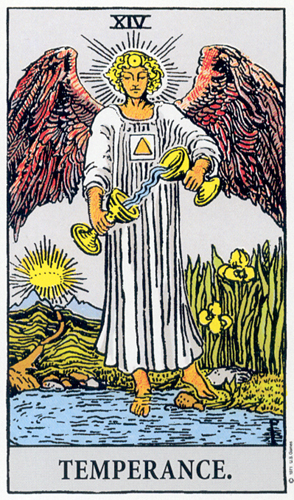 The cards also reflect Waites understanding of mystical Christianity and Cabala. As a beginner you may use these decks without understanding the complex implications of these matters, but eventual familiarity with them will enhance your experience significantly. RWS decks, with the Thoth Tarot (discussed later), are among the most important of modern times. If you want a widely used deck that has a reputation for user-friendliness among newcomers, plenty of helpful resources, and significant depth, and are comfortable with esoteric symbolism, a RWS deck may be right for you. Lets take a closer look at selected decks from this family. The lines which are part of the art remain similar across them, but colors vary (sometimes modestly, sometimes dramatically). For example, compare a card from The Rider Tarot Deck (near right) with the corresponding one from the Universal Waite Tarot Deck (far right). They are similar but not identical. Illustrations: (near right) Temperance from The Rider Tarot (copyright © 1971 U.S. Games Systems); and (far right) Temperance from The Universal Waite Tarot (copyright © 1990 U.S. Games Systems). Click the images for larger ones. With specific regard to The Rider Tarot Deck (also known as The Rider-Waite Tarot Deck) (U.S. Games Systems, ISBN 091386613X), the publisher has said that it is the worlds most popular Tarot deck and it may well be correct. It has long been very popular and easily available, especially in the English-speaking world. Of currently available decks, it resembles the earliest printed members of the RWS family closely and presumably reflects the intent of Waite and Smith reasonably well (see illustration, immediately above, near right). The practical limits of printing technology in the early 20th century probably influenced its frequently flat appearance and limited palette of colors. If you like the design and are a traditionalist, this deck may be right for you. To view more cards from it, click here. Importantly, do not confuse it with the misleadingly named Original Rider Waite Tarot, which is no such thing: it is a reproduction of a later, poor printing of the deck and unfaithful to the intentions of Waite and Smith. 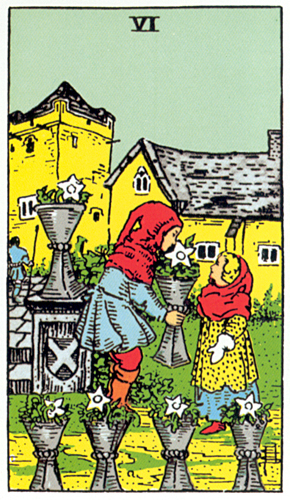 The Universal Waite Tarot Deck (U.S. Games Systems, ISBN 0880794968), drawn by Mary Hanson-Roberts and published in 1990, is closely based on The Rider Tarot (just discussed); both its lines and colors follow its forbear. However, thanks to Hanson-Roberts use of color pencils as her medium and contemporary printing technology, the art is softer; the colors, subtler; and the look, clearly three dimensional (see illustration, immediately above, far right). If you like the basic RWS design but prefer this updated look, this deck may be right for you. To view more cards from it, click here. The Albano-Waite Tarot Deck (U.S. Games Systems, ISBN 0880794666) is another member of the RWS family. Published by Frankie Albano in 1968 (see illustration, top of page), its art includes deep, saturated colors that clearly and dramatically depart from the original design and color symbolism intended by Waite and Smith. The card backs are not reversible. If you like the basic RWS design, prefer Albanos colors, and are not a traditionalist, this deck may be right for you. To view more cards from it, click here. Helpful books appropriate to RWS decks are numerous (see Books) and include Waites The Pictorial Key to the Tarot. The guide continues with variations on RWS . . . click here.